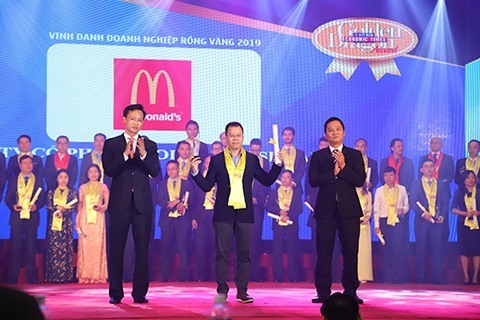 In the recent ‘The Golden Dragon Awards and the Vietnamese Excellent Brand Awards 2019’ McDonald’s Vietnam was honoured in the Sustainable Development Segment for its future proofing application of advanced technologies in operating restaurants and improving service quality. On April 6, Vietnam Economic Times & Foreign Investment Department, Ministry of Planning & Investment, held ‘The Golden Dragon Awards and the Vietnamese Excellent Brand Awards 2019’ to recognise and encourage enterprises that achieve outstanding business results. This year, with the theme ‘New Prestige, New Opportunity’, the organising board presented awards for both foreign – invested and local enterprises that made an effort to innovate and apply digital technology for the development of the community. 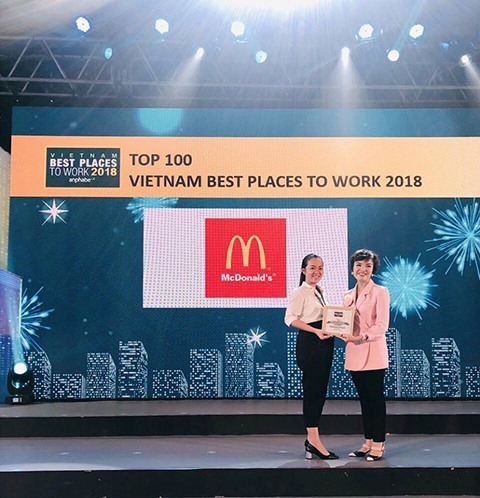 McDonald’s was recognised amongst the sustainable development enterprises thank to deploying ‘Experience of the Future’ (EOTF) model in operating its restaurant system and renovating service systems. The company is considered a pioneer in the food and beverage sector to apply advanced technology to improve service quality. The evolving digital economy and advanced utilities have significantly changed consumers’ habits and purchasing behaviour. This is reflected in ways people are making orders and paying as well as new ways that enterprises take care of their customers. Enterprises will be left behind if they do not keep up with these challenges. At McDonald’s, it’s all about having a ‘customer obsessed’ mindset and the whole operating system is evolving around how to service customers better and more conveniently. In order to keep up with the 4.0 technology revolution, McDonald’s is deploying a series of new standards about EOTF, including the use of technology, new standards of customer experience and service quality. Applying new technology, including self-ordering kiosks, mobile ordering and payment and table locators will not only bring convenience for customers but also help service staff spend more time on customers, enhancing the relationship between the brand and customers. 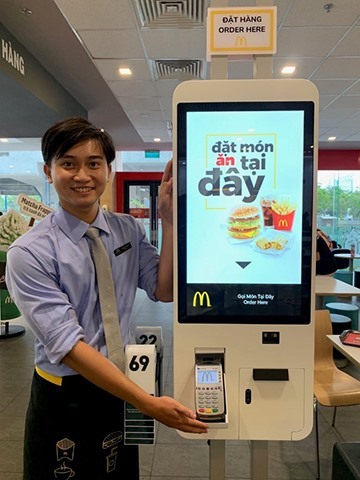 A ‘Guest Experience Leader’ (GEL) supporting customers to experience self – ordering kiosk and use McDonald’s Global Mobile App application to get information about promotions, news, recruitment, the menu and online feedback. According to McDonald’s, EOTF will be part of the new services platform and creating new roles in the organisation, including Guest Experience Leader (GEL) role. This new strategic move is based on two key factors namely hardware and ‘heart-ware’. If there is no heart-ware, use of technology alone in the service chain is considered just a lifeless machine. 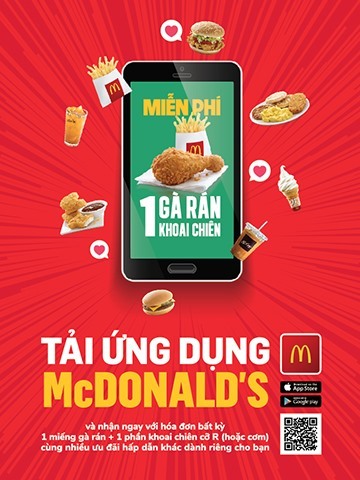 McDonald’s has been serving the Vietnamese customers for five years in Viet Nam since 2014 and now has 18 restaurants in Ho Chi Minh City and Ha Noi. Customers may experience new technologies and services in their stores in these two cities. The company strategy signifies that it continues to invest into improving customer experience and will steadily build McDonald's brand to become a modern, progressive enterprise. The move to EOTF that McDonald’s is applying around the globe is a comprehensive solution to bring about enhanced services and convenience with best quality and flexibility for customers. This is also the strategy that the company has been pursuing to be a future proofing, sustainable enterprise in Viet Nam.